I am forever having to copy record link urls and extract the record GUID from the query string and remove the escape characters. Last week was the straw that broke the camel's back so I had to create a Ribbon Button to do it for me. It is my pleasure to present to you the 'Useful Buttons' solution - small and simple - but most useful! It is a managed solution so that you can install when you need - and then remove without trace afterwards! Get Selected Record IDs - Allows you to copy to the clipboard all of the currently selected record GUIDs in a home or sub-grid. 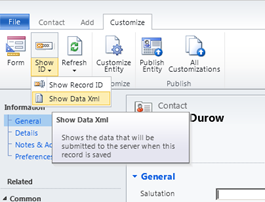 Refresh Record – Reloads the current form – Like pressing F5! Refresh Ribbon – Refreshes the current Ribbon – useful when developing but you haven't wired up any on-change events yet. 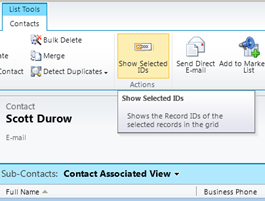 Of course, this was really easy to build using the Ribbon Workbench for CRM2011! Download it for free if you've not already!